Every weekend Brian makes us breakfast in bed. It is a habit that we started early in our relationship and it has survived the years. I do most of the cooking throughout the week so it is nice to sit back and let Brian feed us. When we started it was just a fun, romantic thing… Over the years we’ve made a concerted effort to keep up the tradition. It is so nice to just take a little time to slow down and have this “us” time before we start our day. Most every weekend Brain asks me what I want for breakfast…. unless he woke up before me and got too hungry while I was snoozing… In that case, it’s gonna be waffles (Made with Pamela’s GF Pancake & Waffle mix). Usually, I’m just happy as long as bacon is involved. I’ve got another 5 pounds that I’d like to get rid of before we leave on our MINI Takes the States trip… so I didn’t want all the carbs in waffles or pancakes this morning. Omelets! We have fresh tomatoes and basil (grew them in my very own garden, thank-you-very-much) and a bit of feta cheese left over from making Salads In A Jar. Perfect, right? NO! Brian tells me that he can’t make omelets…. Whatever! Omelets are SO easy. Maybe it runs in the family….just last weekend his Dad and I were talking about making omelets… and he was trying to tell me how hard they were to make. Huh? 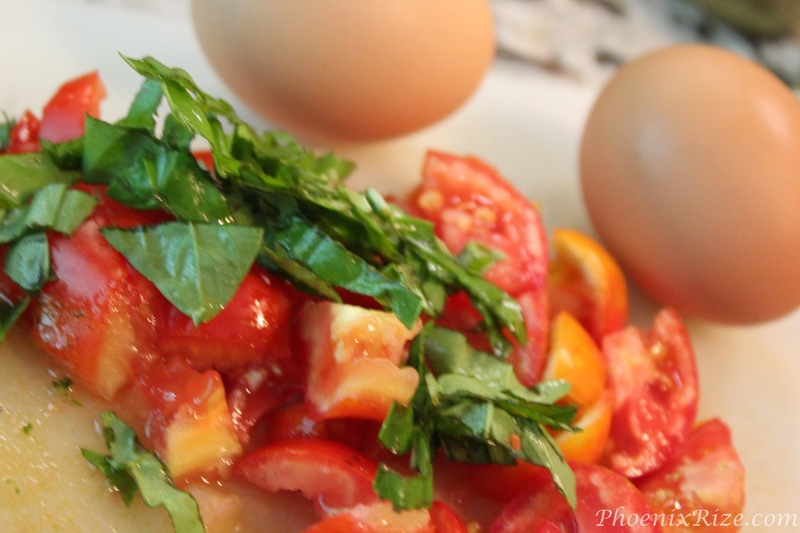 Okay… it is hard to make a “pretty” omelet…. Maybe that is why people think omelets are hard to make. I’m just after a yummy omelet… aside from this blog, no one is taking photos of my omelet… omelets are for eating, they don’t have to be pretty. In a small bowl, wisk the eggs with a dash of water. (Seriously, just a splash of water. Some people use milk, but I prefer to use water.) When the eggs are fluffy (just a light foam on the eggs,) pour them into the hot pan. Now, here’s the trick…. you’re not going to flip the omelet over. With a fork, just keep pulling up the edge of the omelet, letting the liquid egg run under the cooked. If a bubble forms in your omelet, poke it with the fork and allow the liquid to pour through. The inside of your omelet won’t look as cooked as the outside… it will still have a slight shine to it…that’s okay.